I am delighted to inform you that from today the Families Commission is transferring responsibility for the delivery and management of the annual White Ribbon Campaign to the White Ribbon Campaign Trust Board. The White Ribbon Campaign Trust Board is comprised of White Ribbon volunteers who have been working on the campaign for many years. We are very fortunate that these dedicated people have agreed to lead the campaign in its next phase. To the outside world the change in governance will mean very little. The same people are working on the campaign. 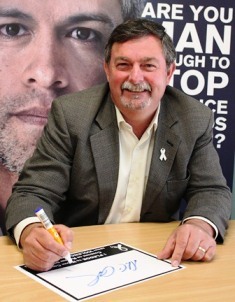 The White Ribbon Committee remains as the expert advisory group, and we are very pleased that the Trust has retained the services of Rob McCann, our campaign manager of the last five years. There is one significant change however. We must now include a focus on fundraising. As the transfer from the Families Commission is being made through a conditional grant for a two-year period, we will be looking to build our revenue streams to fund 2015, and fully fund the campaign from 2016. The Commissioner is correct and we, on behalf of communities across all of New Zealand, will be working hard to reduce the violence and change the attitudes of men. We are very grateful for the support of the Families Commission, and their good management has helped the campaign to work effectively with communities right throughout New Zealand, helping us to raise awareness and get men to take action. Last year’s campaign was the largest yet with significant community involvement, so the time is now right for the campaign to take charge of its own destiny. 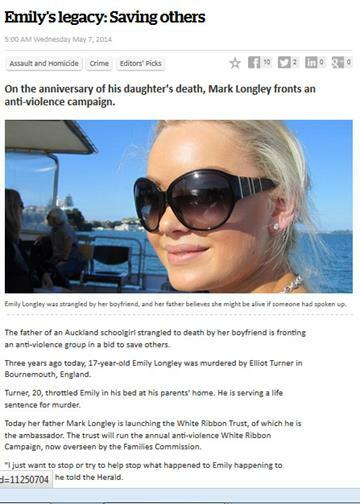 Today is also the anniversary of the death of Emily Longley, who was murdered by her boyfriend three years ago. 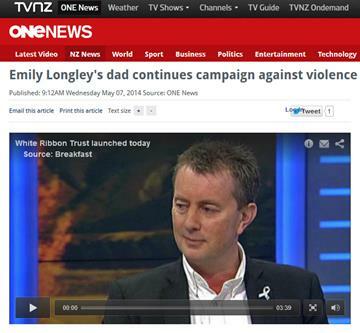 Mark Longley, father of Emily, White Ribbon Ambassador and Trustee explains, ‘As a parent that has lost a child, you are always trying to make sense of the tragedy. 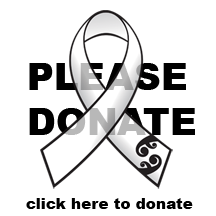 I donate my time to White Ribbon in the hope that no other family ever has to go through what we have endured. 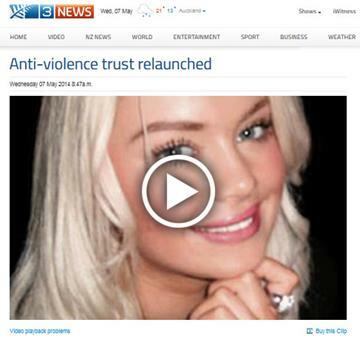 ‘White Ribbon is about men taking responsibility. As men, we can change the behaviour of our mates. 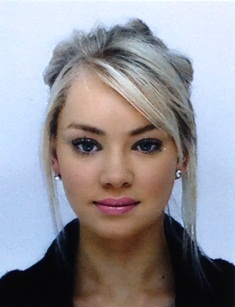 If just one of her boyfriend’s mates had not remained silent, my daughter Emily could be alive today. 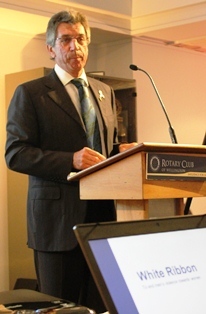 ‘I want White Ribbon to lead a change in our culture. A change where events such as the Roast Busters Scandal could not take place and where 14 women are not killed each year,’ says Mr Longley.